There is stark, simple beauty in tennis’ drama. A shoulder bump on the change-over. The eerie quiet of the crowd, each fan experiencing the game narrative in simultaneously private and shared silence. Tennis offers a mesmerizing psychological atmosphere, one that forces the fan to try to get inside the player’s mind — a frustratingly, delightfully impossible task. It’s a naturally suspenseful game with subtle, complex intensity and a fan experience to match. When the Big 12 recently ‘announced’ its decision to flout the tradition of the game and allow heckling/cheering at college matches, that fan experience faded a bit. In its attempt to expand college tennis’ dwindling fan base, the Big 12 abandoned the sport’s time-honored culture, trading its innate drama for something, well, flashier and more mainstream. Since when is the cultural relevance of a sport contingent on the presence of heckling? Furthermore, the conference spent time announcing its raucous, new atmosphere rather than, say, highlighting its status as a powerhouse in the NCAA, one that includes Oklahoma, the nation’s top men’s team coached by Andy Roddick’s older brother, John. And Baylor, the No. 2 team in the nation. There’s a certain charm in a story like American John Isner’s, despite his languid footwork. The Georgia star turned Top-10 pro. It’s a rare cause-and-effect tale in tennis, and the Big 12’s choice further isolates the NCAA and pro tour (but that’s tennis talk for a post all its own). I like college tennis because it gives me access to the game’s signature suspense and intensity. The split-second glare exchanged during a change-over. That teammate mouthing a muted, secret “Yeah!” when the opponent hits a forehand wide. I can experience the narrative in a way I can’t when I watch Federer on TV, and I can experience it right here, where I live, watching my team. I love to yell and heckle and cheer when I watch basketball (my angst is usually directed at Iowa’s Adam Woodbury), for instance, but I guess I feel protective of tennis. Of its tradition. Its distinct atmosphere. A quiet space that invites me to wonder, “What went through Nadal’s head when he constructed that brilliant point?” The ability to feel completely consumed by the lonely, illusive narrative of the game even as I’m surrounded by other fans. Often, what’s not said in tennis resonates more than what is. This entry was posted in On Reflection on April 21, 2015 by Taylor Soule. Pace: It’s not flashy like an inside-out-forehand up the line. It probably won’t suspend breathing in the entire stadium, clay exploding from the court in chaotic, flying flecks. Yet it is, to me, one of the most mesmerizing elements of tennis, one that forever guides me to the inevitable “tennis-as-life/life-as-tennis” comparison that gives the game and reality an opportunity to enter in conversation. Per my recent decision to run the Des Moines Half Marathon and my tendency to ruminate on the psycho-emotional experience of playing tennis, I’ve recently been thinking a lot about pace. It is the product of control, the result of not one planned, executed shot but many; beauty, defined, in my world. Tennis has a magical habit of subtly leading me to real-life revelations, the kind I probably couldn’t face without the natural metaphoric power of sport. There seems to be some distinct, socially sanctioned pace of adulthood, one that I, as fledgling grown-up girl, should instinctively know. In tennis, I can determine the pace of the match; I’ve always liked that about it. The player who controls the pace is generally the player who wins the match. For a long time, pace in my life felt completely disconnected from pace in tennis. For once I couldn’t find an organic link between my beloved game and my existence beyond it. 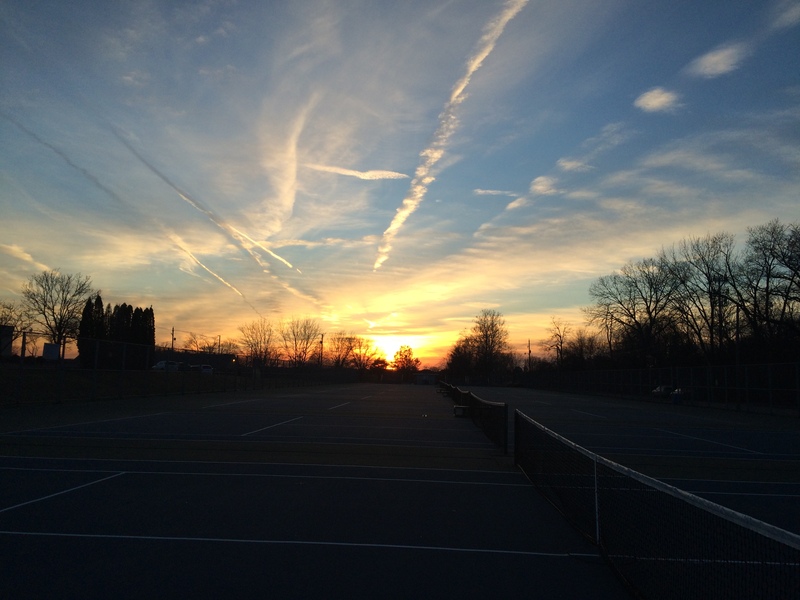 Tennis had long been my go-to gateway to reflection and self-discovery. I didn’t (and still don’t) have a five-year plan, and immediately, I felt behind, as if lacking some concrete, bullet-pointed plan meant I hadn’t really achieved pseudo-adult status. But I think I was more afraid to say I’m happy where I am, and I want to stay here — for a while, anyway. I’m working at an amazing company. I get paid to do cool things like climb on dinosaur exhibits and discuss models of Jupiter made from chocolate cake. Right now, I’m content where I am, and I’m reflecting on it all the while. That epiphany business is great, but I admit I was long bothered by the lack of an innate connection between tennis and my latest 20-something existential crisis. Then I realized winning in tennis is contingent not only on deciding my own pace but neurotic present-ness, too. When pro players talk strategy for their next match, “one shot at a time,” “in the moment” rhetoric inevitably surfaces. Don’t think about the title, the trophy, the rebel thrill of writing on the TV lens with your favorite pink Sharpie (come on, admit it, that looks fun); throw every ounce of energy and focus into the present hit. That’s it. Well, that’s where I am in life right now, too. I’m throwing my energy and passion into my work, my volunteering, my running and my tennis. Will I write my five-year plan eventually (alphabetized and color-coded, of course)? Yeah, I will. But for right now, I’m cool with my own pace and my own neurotic present-ness. This entry was posted in On Reflection and tagged life writing on April 9, 2015 by Taylor Soule.